“MOLINE – Jim and Chris Guld’s Saturday evening was unlike that of many others. But then again, their lives are unlike that of many others. Rather than relaxing on a couch or going out to eat, they helped people find hidden objects scattered around the campus of Black Hawk College with the help of satellite navigation. Geocaching (pronounced geo-cashing) is an outdoor treasure hunting game using GPS-enabled devices. It is perfect for RVers with smartphones. You navigate to a specific set of GPS coordinates and try to find the geocache (container) hidden at that location. Then you log the find and maybe exchange a trinket. There is probably a cache near you right now! This is the official app from Geocaching.com. The Intro app is great for beginners to the game. 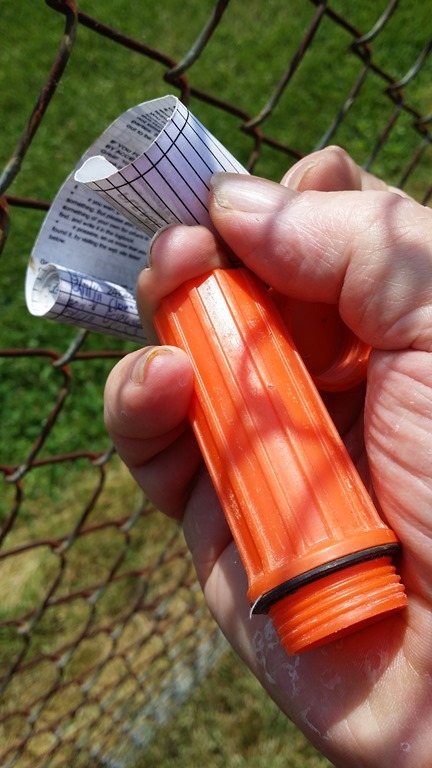 It gives you tips and instructions on how to find a cache and what to do when you find it. I downloaded the free Intro app from the Google Play Store for my Samsung Galaxy Note 3. If you find you enjoy the game, you will want to upgrade to the paid version for $9.99. 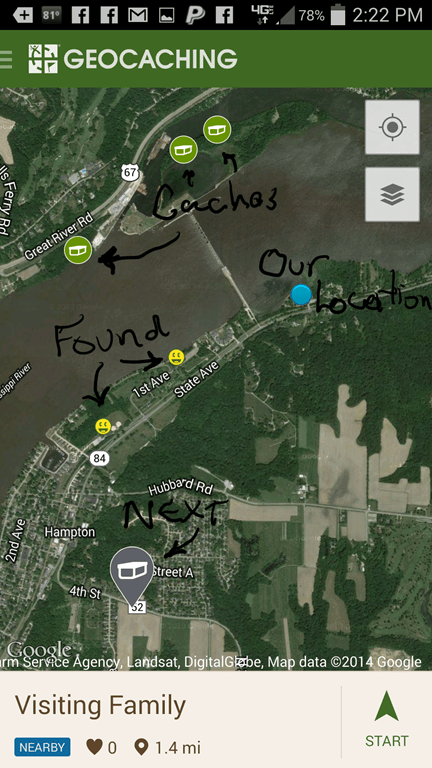 Screenshot of the app with annotations on my cool Note 3 and a shot of a cache container and log. The app is available for Apple iOS ($7.99), Android (Free, $9.99), and Windows phones (Free). The website has plenty of good help to get you started and get the most out of your device and the game. Published by MrGeek, in Blog. Tagged with Android, Apps for Travelers, Geocaching, iPad. Gary and I use the geocaching.com app, and love it when we get to a city where we haven’t downloaded the current pocket query, or when we stop at a rest area. In fact yesterday we found a “multi” – really a puzzle cache at a rest area on Hiway 26 when making a pit stop. Comes in really handy. We stayed in the Welches OR area and were able to find the oldest active geocache in the world about a week ago. We did use our GPSs for that cache, but the phone would have worked justfine. Here’s another geocaching app for the Android market (and its free). Does a very nice job. My husband and I love to geocache. We try to get one in every state or province that we go to. We have found some very unique caches also. Not sure where people come up with these ideas for caches, but some are very amazing. We use a hand held GPS, but I also have the app on my phone, which often comes in handy also.